UK-based Google Maps users can now add new roads, hiking trails or points of interest to the service, after the company extended the reach of its Map Maker tool. The browser-based offering relies on the local knowledge of users to improve the quality, contemporaneousness and overall accuracy of the Google Maps service. 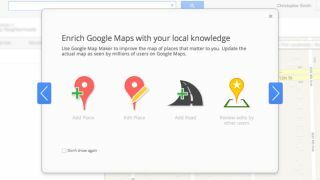 Brits can now go to Google.com/MapMaker and enrich their own locale by adding their favourite shopping locations, natural beauty sports or even town and village boundaries. All additions users make to their neighbourhood will be vetted by Google before becoming an official part of the Google Maps ecosyste. Other users also have the opportunity to review and offer feedback on changes made in their neighbourhood. Launching the UK Map Maker tool, the company said: "Google invites Brits to share and update Google Maps by using their local knowledge and credible local expertise, by helping to update their favourite shops in London's Soho Square, or Corfe Castle, improve driving directions to St Ives in Cornwall, drawing from their knowledge about world-famous tourist destinations or useful updates of the streets of their hometown. "Google Map Maker will make the maps of the UK more comprehensive and accurate than ever before." The service had been available in the US since 2011 and was first launched in India in 2008. Have you tried Map Maker to improve your hood? Share your experiences in the comments section below.